Two weeks back, I mentioned a used bookstore trip that yielded two little haiku treasures. At that time, I took a look at The Duckweed Way: Haiku of Issa. 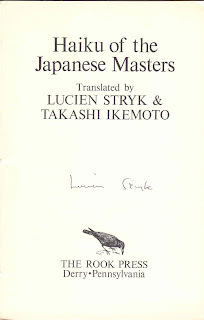 Today I'd like to look at the other volume: Haiku of the Japanese Masters, translated again by Lucien Stryk and Takashi Ikemoto. This collection is once again published by Rook Press of Derry, Pennsylvania, this time in a limited signed edition of 300. The scope is broadened: instead of one poet, we have 55 poems by 23 poets, including the 4 masters of masters, Bashō, Issa, Buson, and Shiki. Some of the poems by the 4 masters I've looked at before and will try not to repeat. One can feel the weight of the blossoms, literally and metaphorically. It would seem that the blossoms are so full and hanging down so low, the poet must bend to avoid hitting them. The bowing is, of course, also a sign of respect. In addition, the sheer volume seems to be overwhelming, so as to cause the poet to bend at the very idea of their immense beauty and profound significance. Both in the previous post and this one, the brevity of Stryk's translations has been emphasized. Brevity is this poem's essence and the reason that it works for me though, admittedly, it almost falters. Bashō, too, has a poem about a nameless tree or flower and the sense of that haiku, as I remember, is one of universality rather than specificity. Buson has a poem about a nameless river wherein the lack of familiarity in an unknown region evokes the unknown, fear of the unnamed. With Chiun's poem there are a number of possibilities. The weed quickening mirrors the stream quickening, so perhaps there is rain or wind. Though unnamed, it is effected by the water the same as any known weed. Perhaps there is not enough here to sketch in a bigger picture. But the poet's observation is intent and precise. Sound has overwhelmed sight (and perhaps smell) in this haiku, but there is something else, too. Has the pheasant ingested the essence of the field, becoming part of the field itself as a result, so what appears to be a disparate evocation of two elements is actually one? Mostly, I only comment on the poems I like, the ones worth passing on to folks or further pondering. I don't, however, like this rendition of Bashō's classic poem. I think I'm used to the poem being predicated on sound. The oral quality in this version shifts to visual, otherwise how could the observer know that there has been a leap before the sound? Or maybe I'm being too fussy here. I noted this one in The Duckweed Way post but it was new to me then and still fresh so here you have it again: I simply love it. This is a haiku that reminds us that Japan is an island nation, whose very existence is inextricably bound with the sea. The ghosts of Japanese culture are conjured here and somehow, for me, they are palpable in this brief little poem. Various cultures ascribe the sound of thunder to various mythological sources - when I was young, it used to be said thunder was the sound of the gods bowling in heaven. Though part of the same chapbook series, The Duckweed Way, which is exclusively Issa haiku, did not have this translation. Who hasn't had this feeling, which in this poem balances precariously between humor and fear (I'm guessing the former for the poet). Beggars know well their clientele, observation being the primary way. Yet, has autumn and its cold winds pressed the beggar a little closer to desperation? In Stryk's rendering, sizing, which functions as slang, may also call to mind the tailor fitting one for a coat. This may be spurious, however, since Issa wasn't likely to have clothes worth very much to anyone. This is one of Buson's painterly poems and I love it - pure image, it still somehow resonates with deeper meaning. Another painterly image, this time from Ryoto. The moment is perfect, the dew reminding us it is only (!) a moment and will soon pass, as will the flowers, and all. The dew in Ryoto's poem has made me look back at the dew in Buson's, with a different eye, and I sense the resonance even more. The quality of the light or the color of the sky, with the feeling of wind and dampness, are all brought to the fore with two simple words "look old." Concision like this in haiku translation is peerless. 6 brief words in Buson's poem and the 1 upon which it turns is "soft." The tactile quality evokes the feel of the iris also and the whole picture presents us with a hint of a complete life cycle. Issa and his compassion for "lower" life never gets old and this is a great little poem I don't recall seeing before. Notice the poet's use of contrast between the very small (insect) and the large (star) with us humans in between, the contrast emphasizing the power of the similarity to great effect. Kikaku's poem is a perfect way to finish - a beautiful wish, almost a prayer, that is lovely in and of itself. This week's poem from the archive comes from issue #119, back in September 2001. Enjoy. One sweet entry after another, Don. Ah well, cold/old, same difference to failing eyes I guess. A favorite of mine by Basho. I agree about the frog haiku--that isn't my favorite translation either. I just discovered, buried behind too many other books awaiting my attention, two collections of Issa's works: _The Autumn Wind_, trans. Lewis MacKenzie, and _The Dumpling Field_, trans. 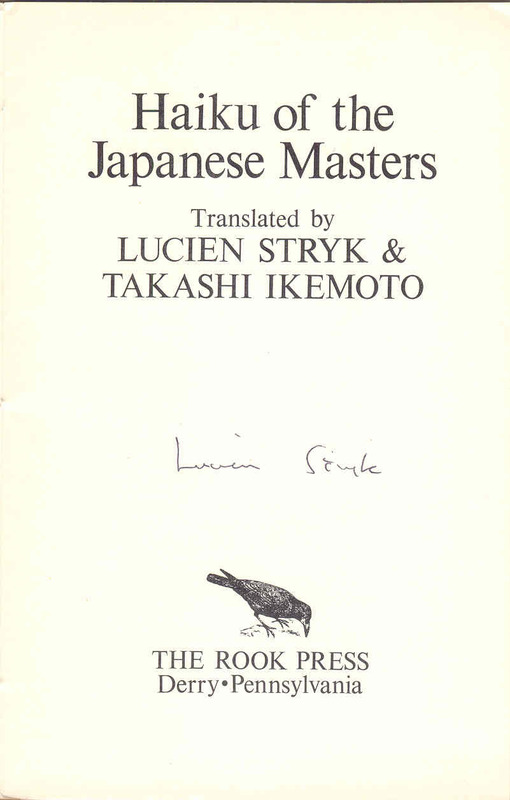 by Lucien Stryk and Noboru Fujiwara. Just lovely. The lot of them. The Basho is a beauty. I've got both those Stryk volumes and mentioned "The Dumpling Field" previously. Maybe it's time to take an extended look at that volume. Happy these clicked for you, Charles. I'm looking forward to your comments on _The Dumpling Field_. 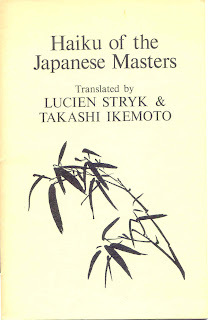 I've seen Stryk's translation of Basho's frog-pond poem before, and also am not wholly satisfied with it -- actually, thinking about it, I haven't been wholly satisfied with any of the translations of that poem that I've come across over the years. It seems to be one of the holy grails of translation, if for no other reason than the persistent diffifulty of getting it right. I'm thinking I may have seen at least one other version of the poem somewhere, though can't recall where and I don't have it in exact memory. Thanks for the observations. I could be dead wrong on this one, but I believe that those are two different Issa poems. I like them both very much and, if they are from the same source, I like both renderings. The Basho is tough to nail. Here are 30 different translations, some of which I think are quite good. I'm a little partial to the Blyth and, of all things, the Ginsberg. Here's something a bit sacrilegious: I'm not really fond of the Basho poem. Maybe it's over exposure, maybe it's, as you say, the inability of anybody to get it properly. In any case, it simply seems to me that he wrote so many others that are better.